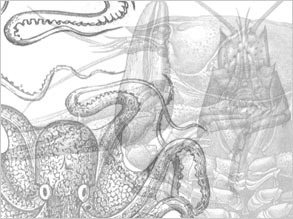 This set of three large illustrated sea creature brushes, comprising of an octopus and two detailed crayfish. The detail on these Illustrations is excellent, there are several more illustration styled Photoshop Brushes available on the site. There are more illustration styled brushes on my site featuring Moth Brushes and Butterfly Brushes if you like this style.